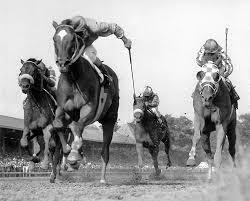 The following horses were ambulanced – “vanned,” they call it – off U.S. (flat) tracks last week. While true that not all of the “vanned off” end up dead, rest assured that many, if not most, of these names will resurface on my year-end FOIA kill reports. In addition, these horses were reported as “bled” or “returned bleeding from the nostrils”; this usually indicates pulmonary hemorrhage. Pulmonary hemorrhage. If they don’t die then they are usually maimed for life in some capacity. That means that their chance of getting a home is next to zippo because they will be a “special needs” horse with lots of very expensive vet bills, limited usage and even just a lawn ornament. Most people today don’t want to support a healthy horse, due to the high costs, let alone a horse like this. Physical aside, the mental issues can also be prevalent as the horse struggles to adjust to a limited life. This industry dumps racehorses after they are done using them up, maiming/crippling them or they die in the dirt. Their aftercare industry funded programs are FULL, and they still continue to breed in order to fill races. So they know that the majority of racehorses being bred will end up in neglectful situations or standing at kill auctions if they make it out alive. This business is a huge contributor to the slaughterhouses, and they don’t give a damn. It’s insanity, and it’s the racehorses that pay with their lives. This is the common scenarios – this is horse racing. It is quite evident that those who support horseracing will never stop in their attempts to discredit those of us who speak out against the atrocities that occur daily to the horses we love. Sometimes we are called names, sometimes we are accused of sitting behind a keyboard and doing nothing when there are horses that need to be saved and sometimes the weak-minded apologists just simply lie and those outlandish lies come fast and furious. The third scenario came to my attention earlier today so I decided that those who lie need to be confronted. This morning I was sent a screenshot that was posted by a weak-minded apologist who can’t seem to stand on her own. Her post concerned a horse by the name of Tug of War, a horse mentioned in Patrick’s post above: The Injured, 10/2/17-10/8/17. This is what the apologist has to say about Tug of War when referring to us “people” who speak out against the exploitation of the racehorse. Patrick posted TWICE that Tug of War was dead? Here on the HW blog? Nope, Tug of War was NOT posted as dead TWICE but Patrick did post that he “bled” during the race. Bled or dead? Perhaps this apologist got mixed up because these words rhyme? She obviously isn’t the sharpest tack in the box but how can anyone fail to comprehend what Patrick reported? Here is what Patrick said and nowhere does he mention that Tug of War is dead….nowhere. Now I realize that desperate people say desperate things in an attempt to discredit those they disagree with but this lie is egregious. Patrick goes to great lengths to provide accurate documentation and those, like this apologist, that try to discredit him, by lying, are simply reprehensible. Perhaps she needs to get her facts straight before she babbles untruths because her credibility, at this point in time, leaves a lot to be desired. Mary, what I’ve found is this – with each lie by the apologists comes another big hit to their own credibility. 4), or they, like this individual, give the name of a horse that was NEVER listed as dead. I am still trying to figure out if these folks simply cannot comprehend what is clearly posted on HW…or if they just become giddy with excitement when they see a horse’s name listed here that is still alive, and think they’ve got something to discredit us…never finishing to read the horse ISN’T reported as dead but bled, vanned off, fell, DNF, etc. Their lies are catching up to them – others read the same things we are sent or come across. Others see that not ONCE has their claim of “that dead horse is still alive!” been proven to be the truth. Yes, not ONCE has a horse that was reported to be dead on HW been found to be alive. They are chipping away at their own believability and credibility. I say, chip away. Spot on, and well said, Joy. Look, the apologists are just plain ridiculous, Their attempts to defend the indefensible are sad and inconsequential. They know racing kills most of the horses, either at the tracks or in the slaughterhouses. Most of these horses have lived barely 1/3 of their lifespan and those years are spent as captives of a corrupt gambling business run by unscrupulous people where winning at any cost is what matters. They also know that cost is borne by the horse. Further, claiming one horse is alive out of a long list of the dead ones, even if true, is a pathetic attempt to discredit those who work hard to end the cruelty. Also, the few horses in safe places out of the thousands at risk are there because of people outside of racing without a lot of money but unlike those in the business they have something called compassion.